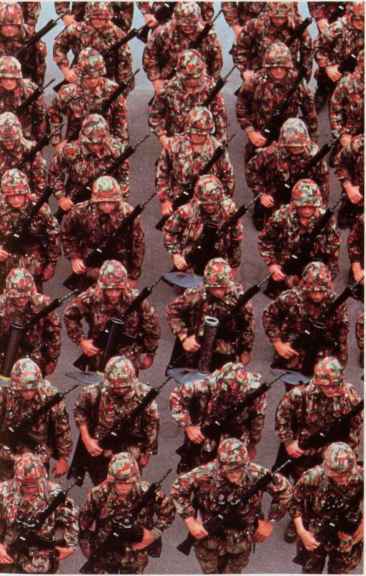 A body of Swiss conscripts armed with 7.5mm Sturmgewehr 57 rifles which they keep at home. More recent recruits have been equipped with the 5.6mm Sturmgewehr 90. Rifled firearms, in which slow, spiral, parallel grooves cut into the bore impart spin to the projectile and give it a considerable degree of stability in flight, existed as early as the 16th century. They were, however, both expensive to make and very slow to load, since a tight-fitting lead sphere had to be forced down the full length of the barrel from the muzzle end. Thus, the rifle remained for many years a weapon mainly for wealthy sportsmen and game shooters. 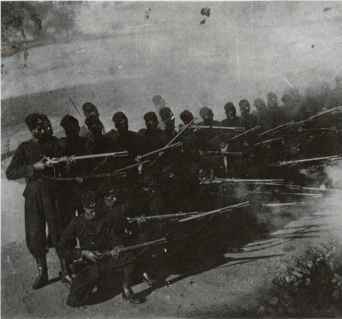 Above: A firing line of British Army Gurkhas in 1885 gives an impression of the firepower obtained from massed ranks. Their Enfield rifles are fitted with the Snider hinged-block breech. 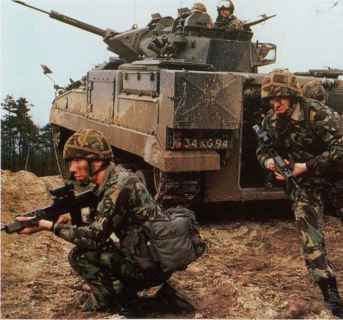 Below: British infantrymen dismount from their Warrior fighting vehicles armed with the shorter L85A1 which is better suited than the L1A1 to the confined spaces offered by battlefield transportation. rifle", with a barrel length of up to 4ft (1299mm) and a calibre of around 0.5in (12mm). Reloading was speeded up by wrapping the ball in a circular patch of oiled leather or linen. During the 18th century, the American colonists' rifles proved their worth against the Indians; against the French in the Seven Years' War (1756-63); and against British regulars during the American Revolution of 1775-83 — when the British also made effective use of the Ferguson breechloading rifle. The rifle's value as a specialist arm was apparent to many British officers who had served in America — and the French use of skirmishers to precede their attacking columns during the Revolutionary Wars necessitated the use of similar troops in opposition. In 1800, therefore, the British Army raised a Rifle Regiment armed with the Baker flintlock, which shot fairly well to 300yds (274m). In the 1850s, reloading speed was much improved by the adoption, first, of the French-developed Minie rifle — taking an elongated projectile with a hollow base, which expanded the lead bullet into the rifling after it had been rammed down — and then of the Enfield rifle. The Enfield, although still loading at only about two rounds per minute, shot well to c880yds (805m) in expert hands, dramatically increasing the effective fire zone of infantry in defence. Most of the world's modern armies were soon equipped with similar weapons. Their effect on tactics, evident in the American Civil War (1861-65), was profound: battles became more open and started at greater ranges; frontal attacks became suicidal; defensive works, le, trenches, were essential: and the roles of cavalry and horse artillery were radically changed and limited. But most European powers clung to their percussion muzzle-loaders in spite of the obvious need for effective breechloaders. Although Prussia developed the "needle-gun" — a single shot, bolt-action rifle firing a non-metallic consumable cartridge — in the 1840s, the arm was not widely taken up. Nevertheless, Prussian victories over the Danes (1864), the Austrians (1866) and the French (in 1870; when the French Army had a superior needle-gun type, the Chassepot, but failed to derive a tactical advantage), led to general acceptance of the single-shot, bolt-action rifle firing self-contained cartridges. Rate of fire was increased by such devices as the Snider hinged-block breech — the Martini-Henry falling-block breech rifle was in general British issue by c1874 — but these were soon superseded by rifles with tubular or box magazines, using smokeless powder. Modern soldiers are equipped with rifles very distinct from those used before. The infantrymen of today's major armies fight from armoured vehicles, dismounting to attack the enemy under cover of machine-gun and cannon fire from their own combat vehicles. The infantryman's rifle must be short and handy enough for him to leap from a vehicle or helicopter. It must be able to fire fully automatic for combat in enemy trench systems or built-up areas. Yet the modern combat rifle must be sufficiently accurate to hit enemy soldiers at up to about 440yds (400m) — the longest distance that aimed fire has tended to occur in modern war. Ammunition must be powerful enough to kill or disable, yet controllable on fully automatic and not so heavy that soldiers cannot carry enough for their mission. "The many mutually-conflicting requirements of military rifles have led different gunmakers to come up with an extraordinary variety of solutions. But before examining the latest ideas for military rifles, it is important to explain how and why the modern "assault rifle" developed as it did. A hundred years ago. the oldest rifles included in this book were the latest word in military technology. Magazine-loading bolt-action weapons firing (by modern standards) very powerful cartridges, these were capable of accurate fire at over 1100yds (1000m) in the hands of a well-trained soldier. Just as the Iraqi Army was hopelessly trounced by western weapons technology in 1991, so the first Islamic state of modern times — Sudan — was defeated in an equally one-sided battle in 1898. Instead of Stealth bombers and "smart" missiles, the British used Lee-Metford rifles; the Sudanese had spears. The devastating effect of magazine-loading rifles against closely packed targets was demonstrated again in 1914. German troops armed with the Gewehr 98 (see page 24) inflicted heavy casualties on French infantry who persisted in regarding the bayonet as the most important feature of their Lebel rifle (see page 20). However, the Germans suffered in turn when they encountered British troops equipped with the magnificent SMLE (Short Magazine Lee-Enfield) rifle (see page 32). 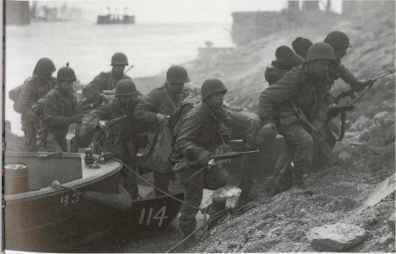 Right: American G.l.s carrying M1 rifles climb the banks of the Rhine during the Allied push into Germany in 1945.
dominated by artillery and machine-guns. There were no massed targets 1000yds (914m) away: instead, infantrymen found themselves fighting at close-quarters. Hand grenades became a I key weapon and the first sub-machine guns were soon in service. Semi-automatic rifles had already appeared gun designers in several countries had developed them by the end of the 19th century, but none had entered military service by 1914. Some soldiers viewed them with suspicion, arguing that such weapons would simply lead to excessive ammunition expenditure. Since troops with bolt-action rifles rifles could already fire off all the ammunition they carried in less than ten minutes, what was the point of shooting any faster? On the other hand, some soldiers wanted fully automatic rifles — a number of British officers came to this conclusion as a result of their experiences during the Boer War. It was appreciated that attacking troops needed to lay down suppressive fire on the defenders' positions in order to make a successful assault. Semi-automatic rifles were used during World War I in limited numbers. Some German aircrew used Mexican Mondragon rifles — made in Switzerland — in the first aerial battles. In 1917 the French introduced several semi-automatic rifles made at the St Etienne arsenal. They were not very reliable, but it was a start. In the USA. J. D. Pedersen developed his "Pedersen device" which fitted into a slightly modified Springfield rifle (see pages 70-71). When inserted, the device allowed the rifle to fire a pistol cartridge instead of its .30" round. At long range, soldiers fired standard ammunition: but for close quarter battle, they were supposed to stop, put this device into their rifles, add a magazine containing 40 modified .32" auto cartridges and continue fighting with what was now a very long sub-machine gun! Some 65.000 of these were made — in conditions of great secrecy — but it was never a practical proposition. over conventionally-armed opponents (see pages 74-75). It was a superb battle rifle accurate, hard-hitting and reliable. By World War II a typical 8-10 man infantry section often included thrge, different weapons: bolt-action rifles, sub-machine guns and a light machine gun. The soldiers had to carry two, or sometimes three, different kinds of ammunition that were not interchangeable. An obvious answer to this problem would be a weapon that combined the long range accuracy of a rifle with the short range firepower of the SMG. Several gun designers produced rifles capable of fully automatic, but with a few exceptions, like the superb Tokarev M1938, such rifles were uncontrollable. The main problem was the ammunition. Rifles still fired cartridges developed at the end of the 19th century for long range shooting. To inflict lethal injury at over 1100yds (1000m), rifle bullets needed to be heavy and had to be fired at high velocity. To fire such ammunition on full automatic demanded a heavy gun, usually on a bipod, if the burst was to have a hope of striking the target. Only the unique German Fallschirmjagergewehr 42 (see page 24) achieved the theoretically impossible dream: a fully automatic rifle capable of firing the 7.92 x 57mm cartridge. Designed by Louis Strange expressly for the German airborne forces, it was an ingenious response to the paratroops' request for a long range automatic rifle. 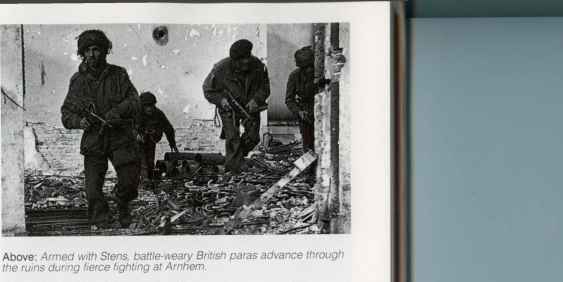 The German paratroops had suffered catastrophic losses on Crete when, armed with pistols and SMGs, they had had to face British and Commonwealth soldiers shooting SMLEs and Bren guns. To solve the mutually incompatible requirements of such a design, the FG42 sacrificed structural safety and its very efficient muzzle brake produced a vivid flash with every shot. However, the FG42 was an inspiration to post-war weapons design, influencing the British EM-1 and EM-2, which led to the Individual Weapon (see pages 46-47). and the US M60 machine gun. While the US Army was buying Garand rifles during the 1930s, the Germans were experimenting with lighter cartridges designed for combat at the new battlefield ranges of 330-550yds (300-500m). By reducing the power of the cartridge, selective fire was a realistic possibility and soldiers could carry larger quantities of ammunition. The new cartridge, the 7.92 x 33mm kurz, contained half as much propellant as the 7.92 x 57mm. Sacrificing long range performance, the kurz round was sufficiently hard hitting and a major step forward. 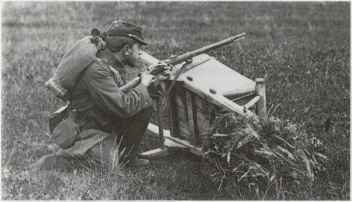 Although the .276" cartridge developed in the USA anticipated the principal characteristics of the German round, the Germans were the first to introduce a weapon recognizable as a modern assault rifle. The MP44 (see pages 28-29) was introduced despite Hitler's express orders to the contrary and soon proved its value on the Eastern Front. By comparison with modern assault rifles, it is heavy and awkward to fire from prone — but it could still hold its own.